This is not a green car. It’s better than before, but it remains one of thirstiest cars on the road. To make it better, and greener (inadvertently? ), its manufacturer has found some really imaginative ways. Its about aerodynamics. 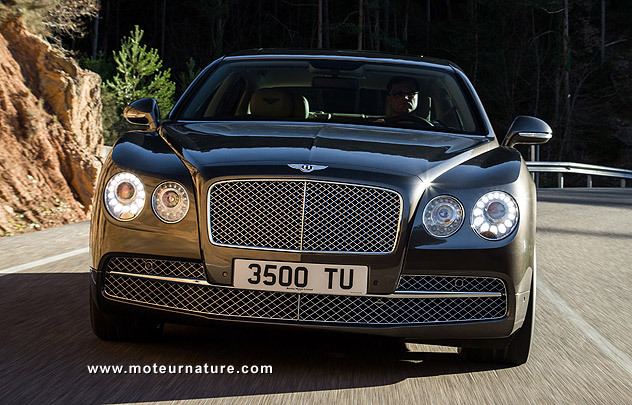 With a thundering 616 bhp, 590 lb-ft W12 engine under its long hood, the new Bentley Flying Spur is incredibly fast. It’s assuredly the fastest four door saloon in the world. Top speed is 200 mph, and the car only needs 4.3 seconds to go from 0 to 60 mph. Driving at those speeds, aerodynamics have a huge importance and an intelligent way to make the car better here is to make it go closer to the ground. This is where the air suspension comes to play, but the engineers didn’t do it the way most people would have imagined. It’s a two-stage set-up, with first step at 121 mph! That’s when the front of the car gets lowered by 5 mm and the rear by 10 mm. All automatically. The second step only comes when the driver gets serious: at 149 mph. The Bentley is further lowered, by 8 and 13 mm. With this system, I’m happy to report that driving between 150 and 200 mph will be more stable, and more economical. No car deserves more the title of “built for speed”. 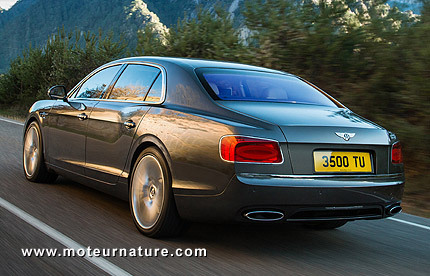 To fully exploit it, the Bentley Flying Spur needs to be driven at 150 mph. How many of its drivers will ever do that?